Unless its a color combination of directly available colors such as magenta,cyan or yellow, We often starts entering the cmyk values starting from cyan.I have entered some value of cyan,say a 53%. 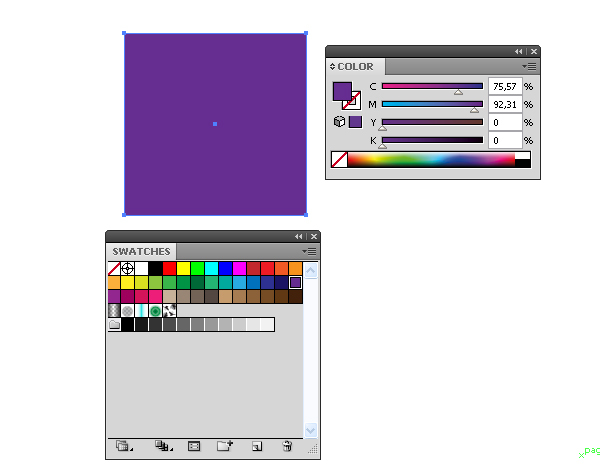 but when i randomly entered different values, that completly messed up everything,now from this scenario, i want to get to the skin tone color that i m thinking about,This is possible only when i master mixing patterns of those cyan,magenta and yellow.Simply i want to know which color comes out when two colors are mixed .And if i already had a color in my mind,which colors should i mix to get to that destination. Well, the major question is: How to mix colors? This question is complex and simple at the same time. In fact, I have never seen it in any of the tutorials. What we usually read: fill the object with red color (C = 0; M = 100; Y = 100 and K = 0) or (R = 255 G = 0 B = 0). 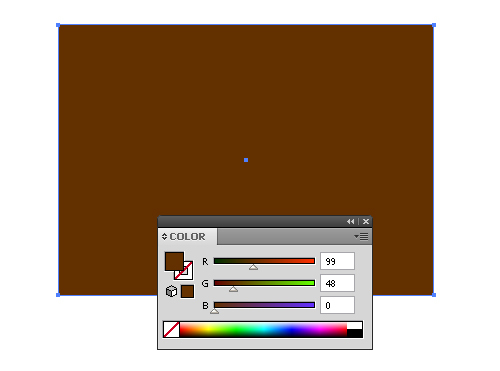 In some tutorials we may not find the digital color values, but only its name, something like do it yourself. 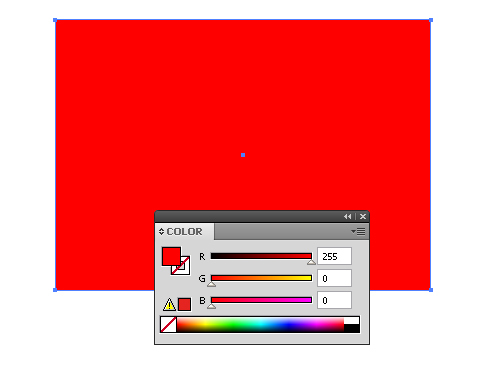 Can you tell the difference between two red colors, the numerical values of which I have mentioned above? Do color models differ and how? How to learn how to make bright and pure colors? How to learn how to get shades from the basic color? I also asked myself all these questions. My answers will not be of academic nature, as they are obtained in a practical way. Maybe somebody would like to correct me or convince me otherwise, I will be happy. After all, we are all learning, no matter how important we currently appear to be. Ask me: What color is this (C = 27; M = 57; Y = 22 and K = 46)? I'll tell you, I do not know and do not want to know. Do you need to get purple color, its shades, make it bright? Let's mix! Indeed, a lot of professionals remember the numerical value of certain colors, it is because they often use them and have already memorized them, you will also remember the words that you are reading now. 1. So let's start. How to get basic colors? I adhere to practical solutions, theory does not make any sense here. For example, we need green. So what's the problem? You already have it. 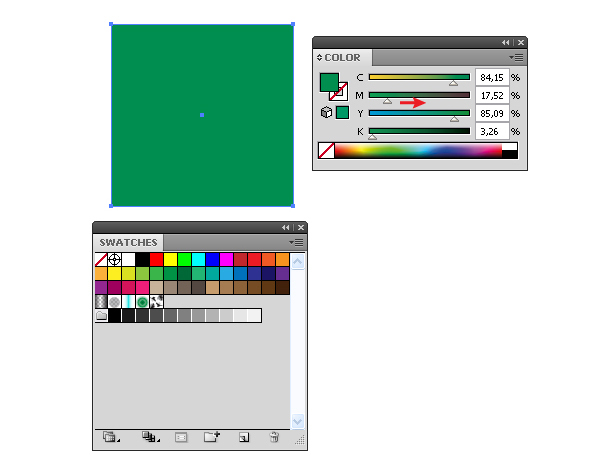 Click with the cursor on the CMYK Spectrum in the Color panel, and green color is ready. Not the green color that you like? Edit the result, and here we have some prompts left for us. 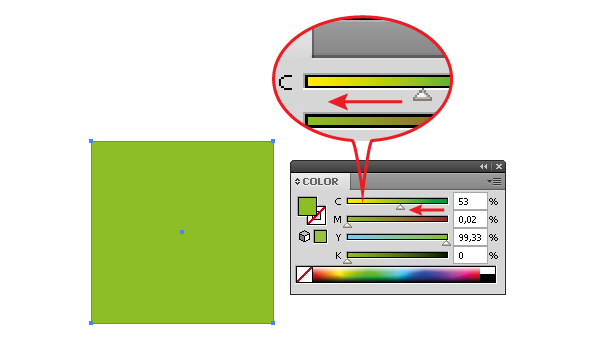 You can see that shifting the slider «C» to the left color is getting yellow, and shifting it to the right makes the color become green. 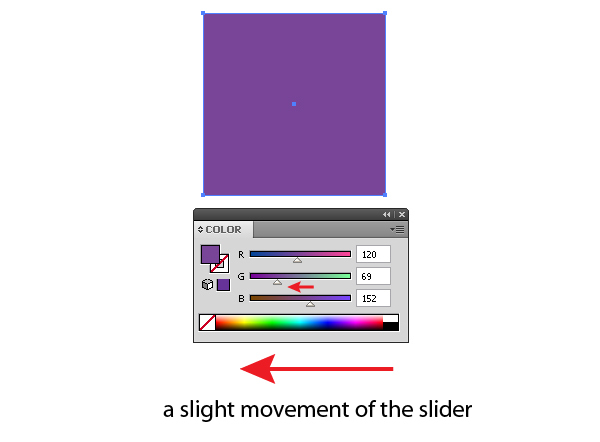 It is hard to describe colors, but you, as well as I, can see how the color will change as a result of moving the slider. You can see how the color is changing when you move the other sliders. 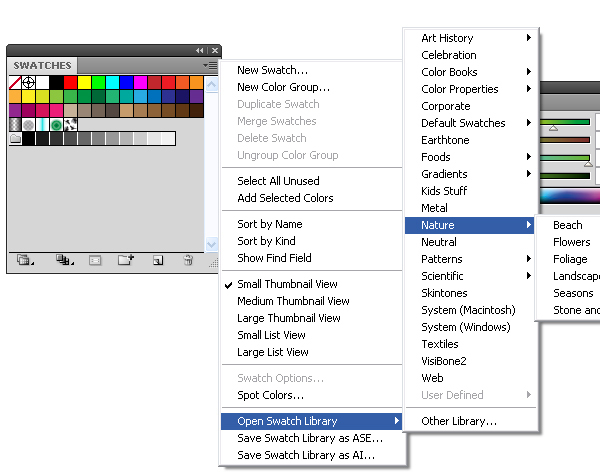 Use colors that are already there and adjust them as you wish. It makes no sense to get the color from scratch. 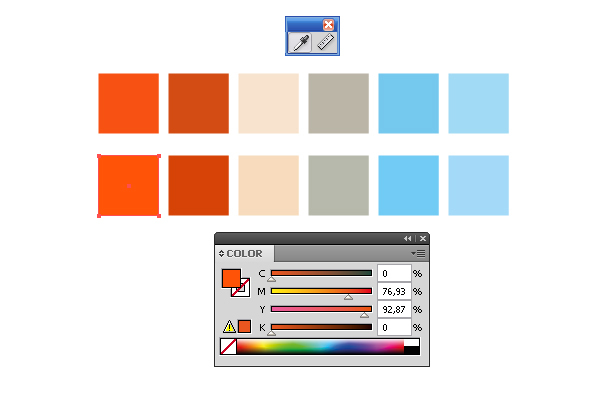 To start mixing, you can use the CMYK Spectrum or the Swatches palette, thanks God, illustrator contains enough samples of color. 2. You got your basic color. Now how to get its darker shades? 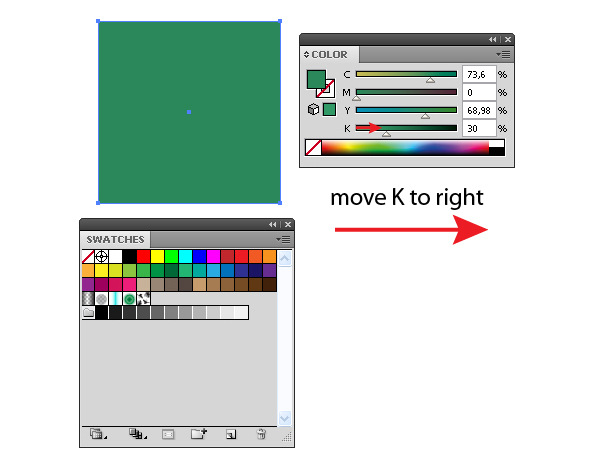 To get darker shades of the basic color, it is enough just to increase the value of K, that is to add black color. This answer is obvious. Let's see. Do not you think that the color is somehow dirty? I'm not saying that this is not the right answer, but not in all cases, this will allow you to achieve a good result. 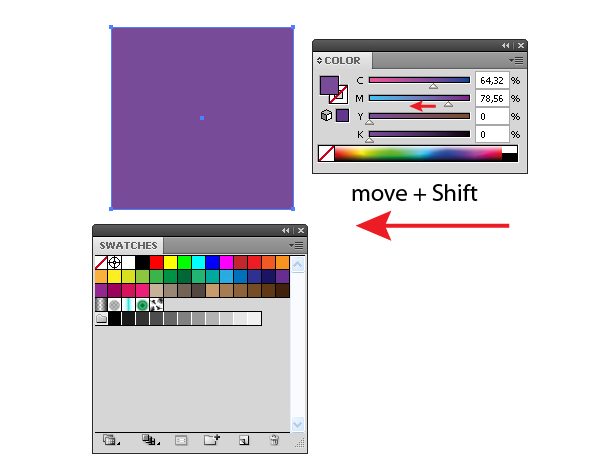 The second method is to get the darker color of the basic color is to shift any slider, except for K, in the Color palette to the right while holding down the Shift. The result is purer. Not dark enough? What should I do? We can see that you can increase the value of M.
3. Getting light shades of the basic color. Here you cannot add white color instead of black. Those who draw with coloring will confirm that just by adding of white lightens the color. Do you have any ideas? I got one: move any slider to the left holding down Shift. 4. What is the difference between the color models? CMYK color model is used in printing and contains fewer colors than the RGB color model. 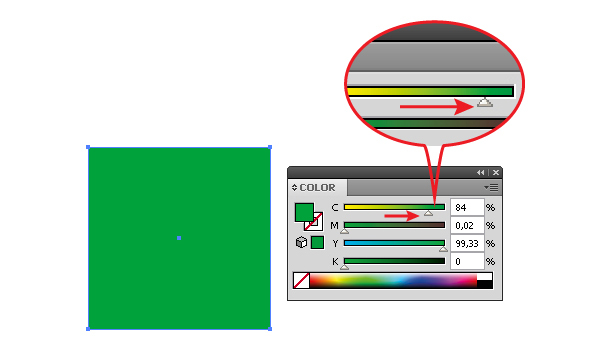 If you create your image not for printing, use the RGB color model and colors will enjoy your eyes with its brightness. 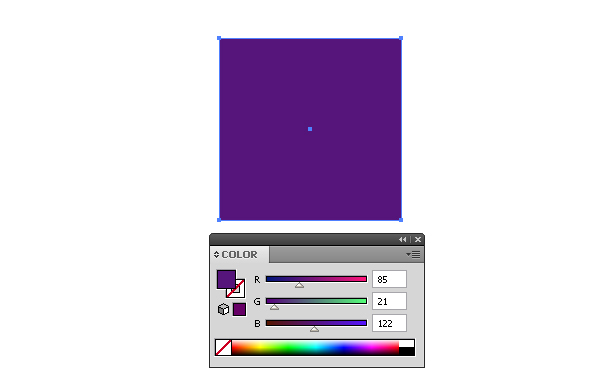 You can change the view of the Color palette, but that does not mean that you changed the color model. To install the RGB color model (if you do not have it installed), go to File> Document Color Mode> RGB Color. It is more convenient to mix colors using CMYK of the Color palette, in other words we can say that this type of panel is very user-friendly. 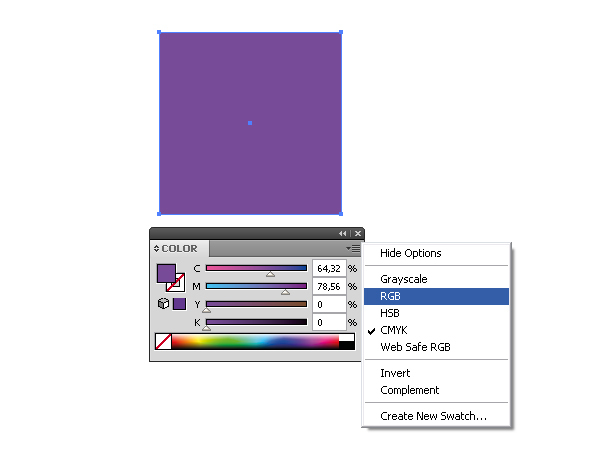 When the basic color or shade is obtained, the switch the type of the Color palette to RGB, adjust the color, making it brighter. 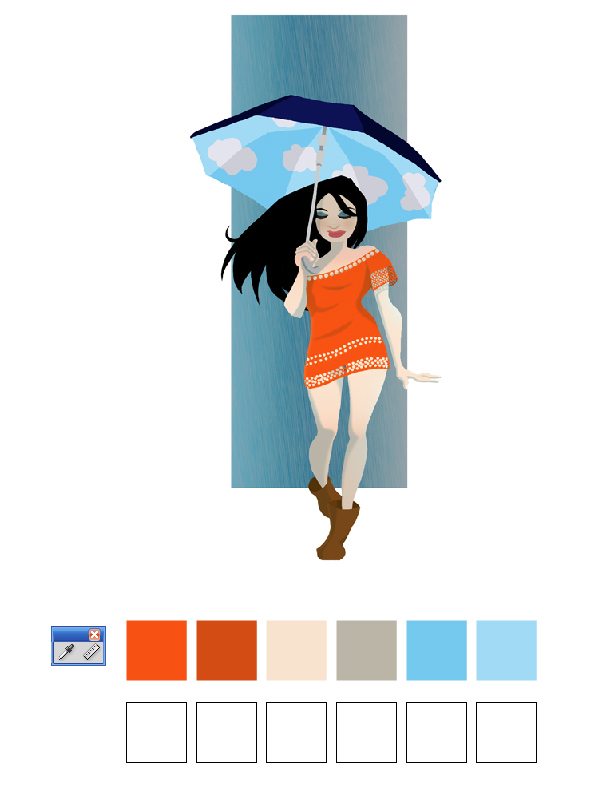 When you have enough experience, you can mix colors using the RGB type of the Color palette. All of the above mentioned methods work there as well, but maybe not so noticeably. 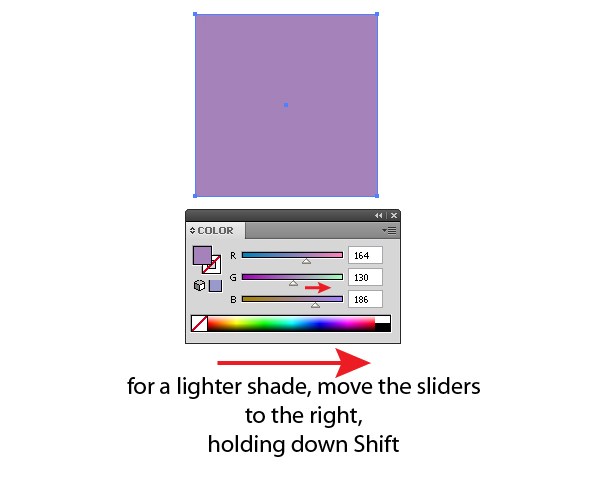 But here, on the contrary, for a lighter shade, move the sliders to the right, holding down Shift, and to get a darker shade move the slider to the left, holding down Shift. 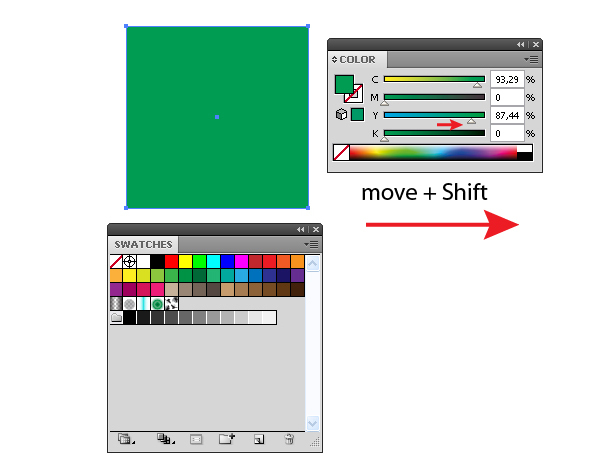 There is no need to follow the rules without thinking, because you can see, and you can always adjust the color by moving one slider only. It's quite a neat work, sometimes it is enough just for a minor movement to improve the results. Well, in the end I would like to say: do not mix colors isolated from other objects. Only in a combination of the variety of objects they may come to life and take their exact location. In practice, it looks like this: before coloring objects, first, I create a background color, and then color the largest objects, gradually moving to smaller ones. 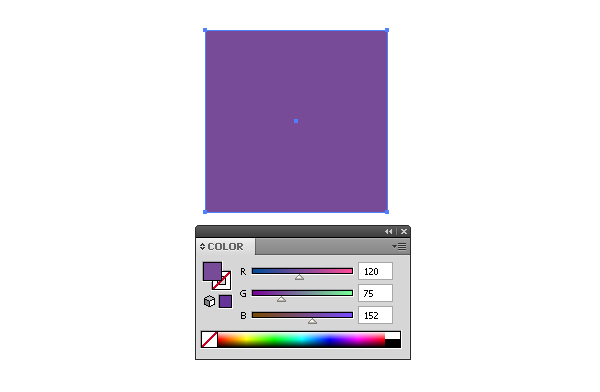 I think it would be a good experience here if you paste any raster bright image into the document and fill a few rectangles in its basic colors using an Eyedropper Tool(I). 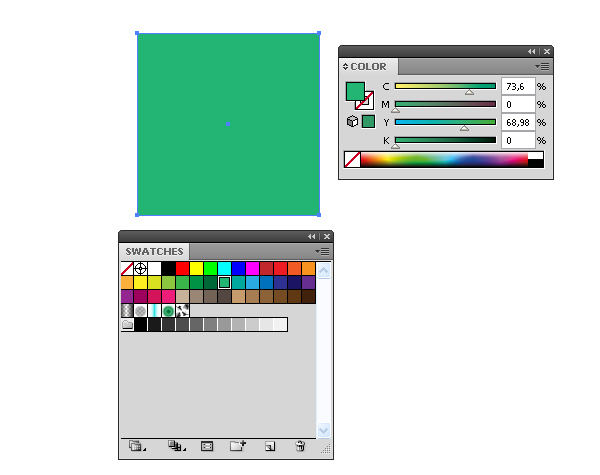 After that, fill a bunch of other rectangles, using a mix of colors in the Color palette, trying to repeat the result. It took me 2 minutes to get this job done, what about you? Ask me questions. Only in dispute born truth. and brown is not there on that 360 degrees color wheel...... can i recognize the color that results in brown when shading or tint applied to it??? is there any technique for that?? or it comes with experience??? I think that you don't need a theory. Your eyes are your best friends. I don't see any problem with the brown. thank u sir,but what if i need a more desaturated brown.... like a human skin ........ from which color should i trace that??? Can you show me a photo of such a man? I'll try to mix the colors for you. what if we want a desaturated brown(a little lighter brown)??? what if i want a desaturated version of that brown?? You should always work with samples, such as photos. Even the artists are doing so. I'll show you how to do it later.